Boil-off is one of several paths that highly toxic Hydrogen Fluoride (HF) can go airborne into the community. In the past, the primary focus has been on the release of superheated HF and Modified Hydrofluoric Acid (MHF) from oil refineries’ settler tanks, because flash atomization causes 100% to form a ground-hugging, highly toxic cloud (see: Flash Atomization of HF and MHF). Mobil’s original intent to suppress flash atomization was to add sufficient additive that the MHF was subcooled, that is, the boiling point is above the operating temperature. (As we now know, an additive level sufficient for subcooling is incompatible with the alkylation process.) However, even subcooled MHF spraying under high pressure from a rupture of a tank will break up into small droplets. While not nearly as fine as droplets from flash atomization, they nevertheless evaporate. Evaluation of how much was the objective of the large-scale MHF release tests conducted by Quest Consultants in 1993 (see: Superheated MHF Excluded from the Only Large-Scale Test Series). Another significant path for MHF to go airborne is boil-off. This occurs, for example, if the rupture is in the top section of a settler tank. 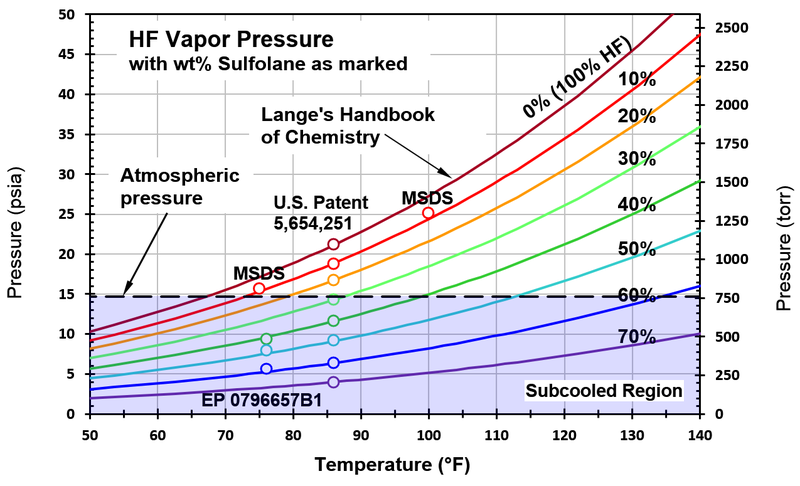 At the release of pressure, the superheated hydrocarbons (typically isobutane with a boiling point of 11F) and MHF (boiling point of 71F at 6-wt% sulfolane) are highly out of thermodynamic equilibrium at the tank process temperature of 106F. The tank’s contents will boil violently and much will be expelled from the tank before plunging in temperature to the low boiling point of the remaining liquid. The volatile hydrocarbons and MHF will then boil off at a rate governed by the transfer of heat from the environment through the tank walls to the cold liquid. A second example of boil-off is the primary focus of this post as well as of item III from the post Five Points TRAA Science Advisory Panel Members Would Have Liked to Make at the Rule 1410 Refinery Committee Meeting. Except for a 15 wt% sulfolane additive used for transportation, which increases the boiling point of HF modestly from 67F to 76F, MHF trucks have none of the other refinery-based mitigation systems. With an air temperature of 87F, highway surfaces can reach 143F. The stored solar heat in a hot highway will vaporize MHF. In addition, the direct heat from the sun over the duration of the spill will add significantly to the boil-off. Consider a massive spill from a truck transporting 33,000 lbs of 15 wt% MHF (boiling point 76F) onto a sun-baked highway pavement at 140F. The MHF immediately cools the surface of the pavement to its boiling point of 76F. 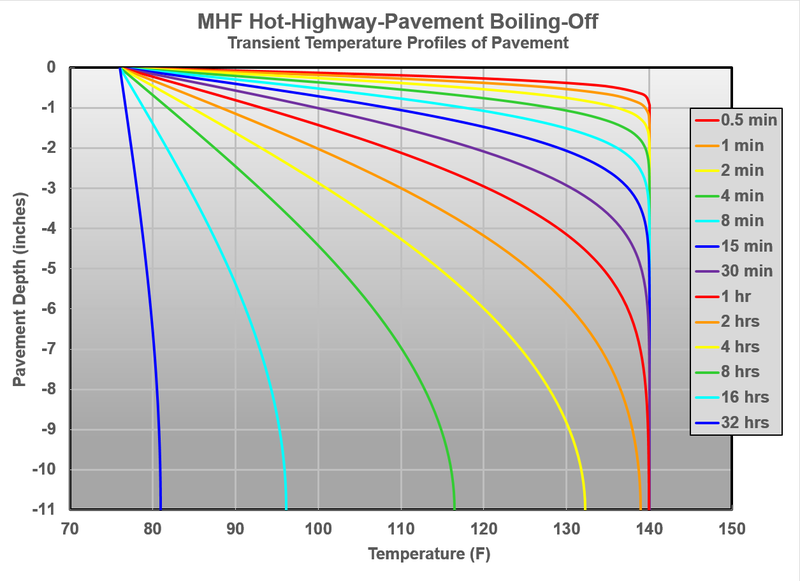 The temperature response of the pavement with typical parameters is shown in Figure 1. “Superheated MHF Excluded from the Only Large-Scale Test Series” by Jim Eninger, Ph.D. In their attempt to do something to prevent the formation of a toxic cloud, in the early 1990s, Mobil engineers settled on the additive Sulfolane to suppress the vapor pressure and move HF fluid properties into the subcooled regime, where flash atomization will not occur. But, as seen in the graph above, at least 45% Sulfolane by weight (45 wt%) is needed to achieve subcooled HF at a typical settler-tank temperature of 105F. Although they did not know it at the time, this level of Sulfolane is far higher than the alkylation process can tolerate and still function. 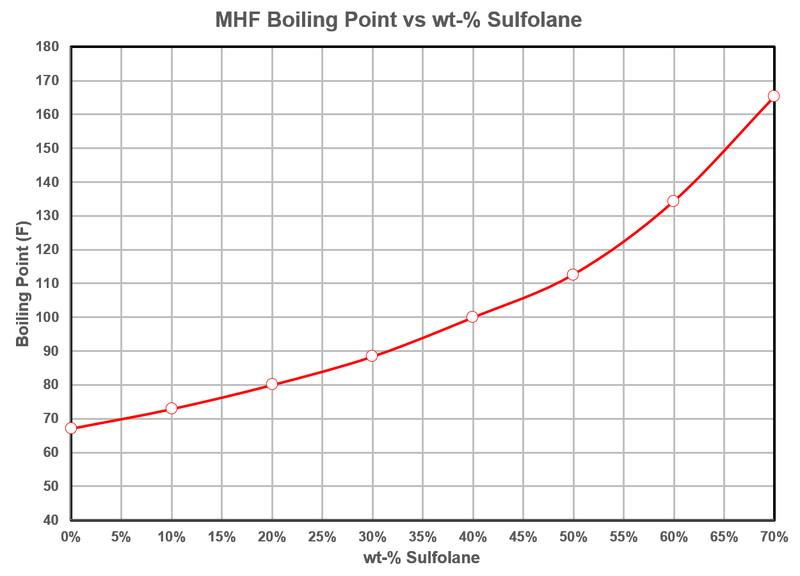 In refineries that use MHF, the Sulfolane level is as low as 6 wt%. That’s 1 mole% or one molecule of Sulfolane for every 100 molecules of HF.